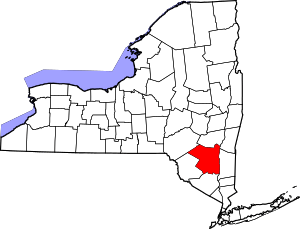 I live in an area of New York state where gold is not prevalent, I am not saying that there is no gold here, it’s just hard to find where gold has been found before. New York State has a law on the books known as the King’s Law of 1775 which states that any gold found in New York belongs to the state even if you own the land. I find this to be absurd for we don’t have a King. At any rate I believe that this law has kept anyone from recording any gold finds. In my area of New York I have heard of legends of gold finds. I have always figured that we should have glacial gold present seeing that our neighboring states of Vermont, Massachusetts and Connecticut have glacial placer gold present. There has been a lot of lead mining in this area and I have read a good many of the geological reports of these mines in the area and all had a very small amount of gold present. There was not enough gold to be profitably minable, so I wonder if any of that gold may be in the tailing piles or was it melted down with the ore.
Hillbilly John and I have been on a quest to find gold in this area so that we may have a local spot to gold prospect in, we still enjoy traveling to distant locations but it would be nice if we had something close enough for when we have just a day or two to prospect. We decided one day to go to Ellenville NY and do a little prospecting on the Sandburg Creek. We went in by the base ball field and we were behind the high school foot ball field. We each did a couple of test holes, digging a bucket each screening the material down to 1/2 inch and then panning it out. Hillbilly John was the first to find a speck of gold. As I was screening I found some pottery shards, looked like from an old crock, we found lots of lead (galena). I finally found a piece of wire gold down at the bottom of my bucket. In the past I have test panned other streams in the area and came up empty, as little as this was we were elated to have found 2 little pieces of gold. I suspect that there is gold in the Shawangunk Mountains, not because that there is a lot of magnetite but because of the sulfides that are present. We test old mine sites, gravel pits, river beds and any glacial till that we may come across. I have tested some in my own back yard and found very fine gold, like powder. I was once poking around some old limestone mines up in Kingston and what caught my eye was about a 4 foot layer of sand that was loaded with sea shells sandwiched in between 2 separate strata. I didn’t have any thing with me so that I could take a sample but it is something I will explore in the future. The search continues. If you suspect that there is gold in an area test pan it, what’s it going to hurt and who knows you just may find yourself a honey hole.